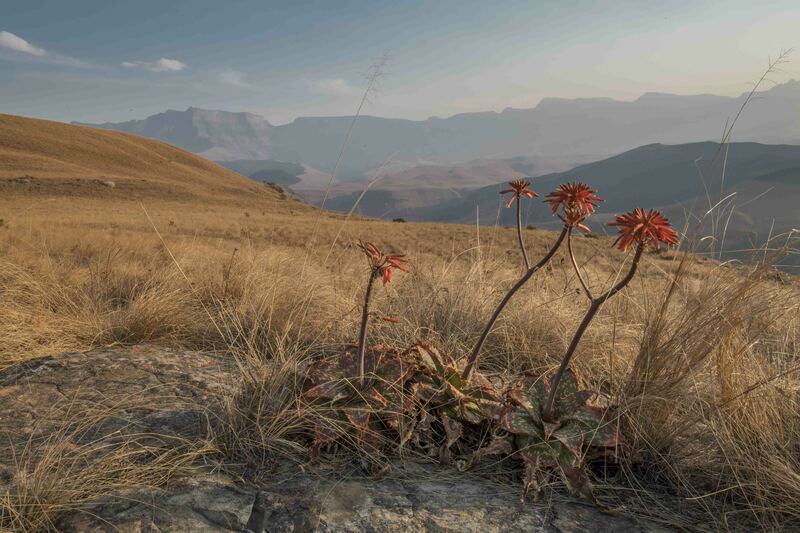 This is the last post from our Drakensberg trip showing some of the majesty of the Giant’s Castle area of the Ukhahlamba Drakensberg in central South Africa. We went there in mid-winter hoping to see snow. 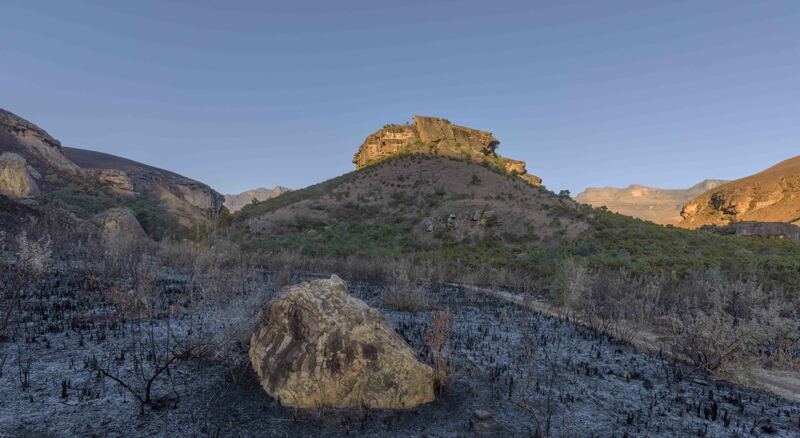 No luck, it was cold at night and in the early mornings there was frost on the lower reaches next to the Bushman’s river but no snow up on the mountain tops. 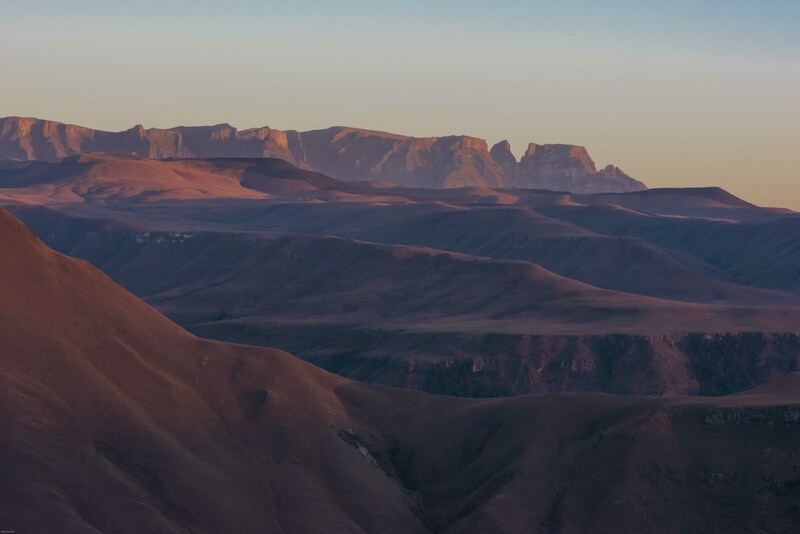 The majesty of the scenery dictated that we rose well before sunrise which was around 7h00. 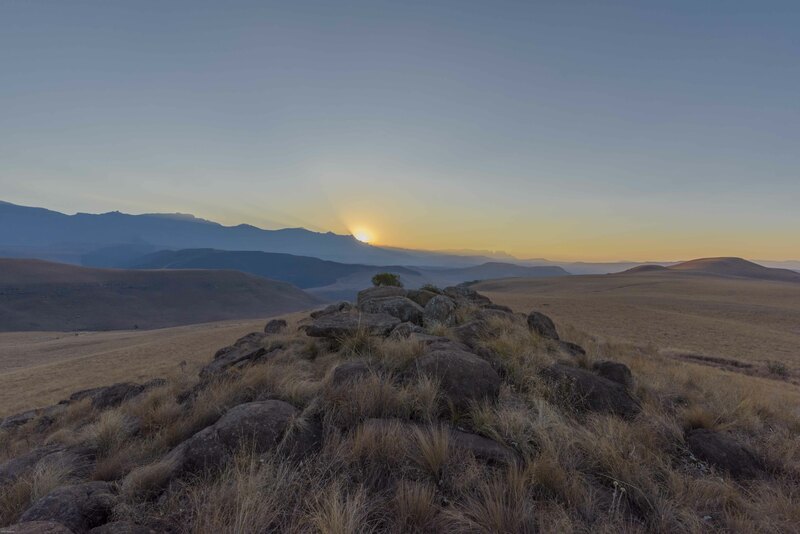 This was the scene looking east at the sunrise from behind the vulture’s hide. 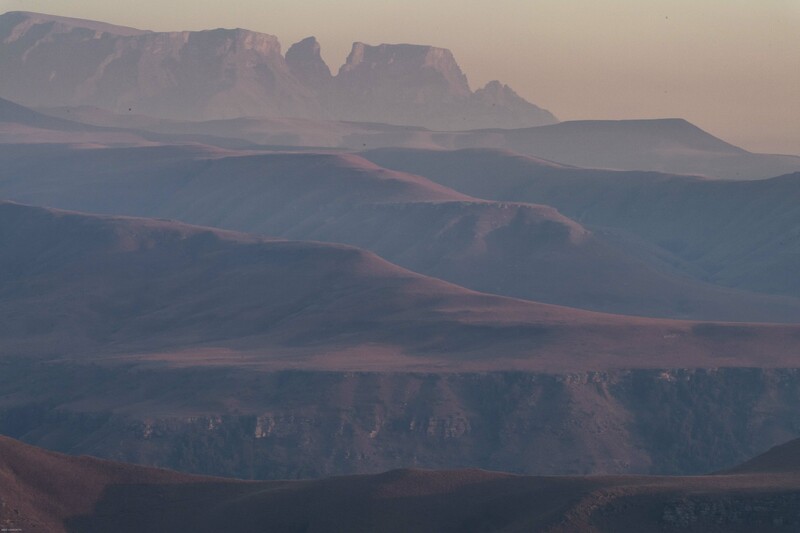 Slowly the sun peered over the middle berg to shine on basalt buttresses in the distant upper berg. The colours were soft, infused with purples and mauves. 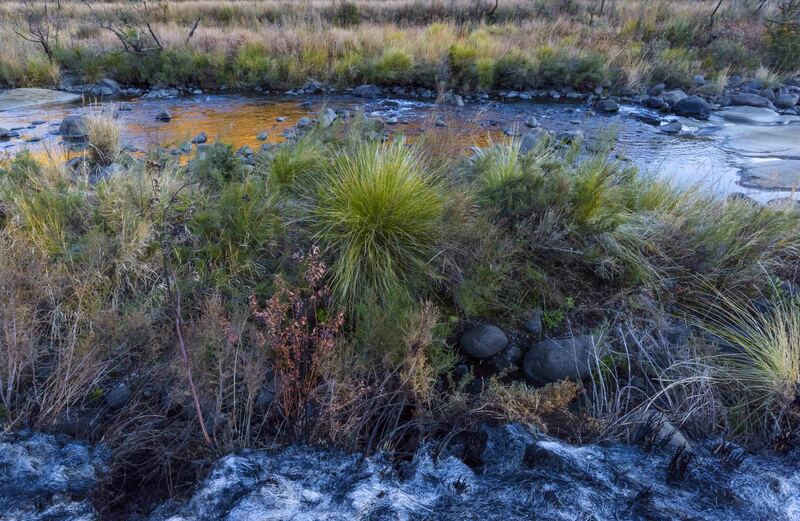 As the sun rose it brightened revealing a pallet of unexpected colours. 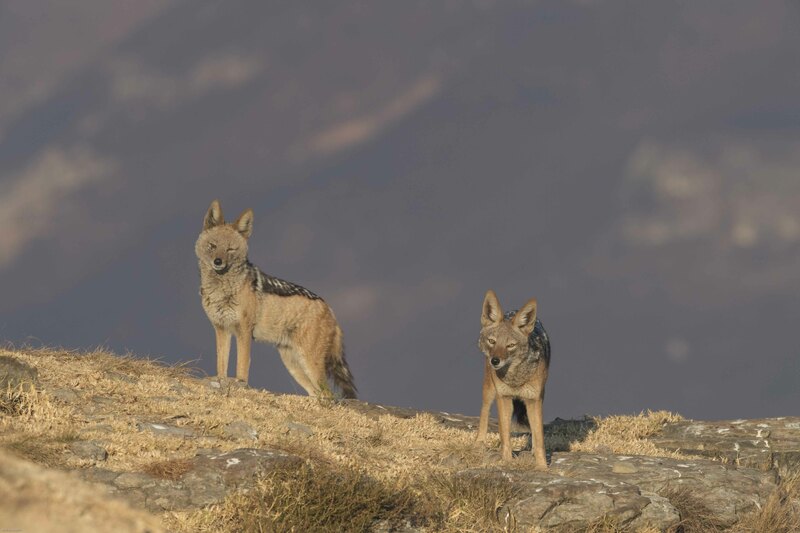 On the edge of the ridge in front of the hide this pair of Black-backed jackals came to steal some of the bones we put out for the bearded vultures. 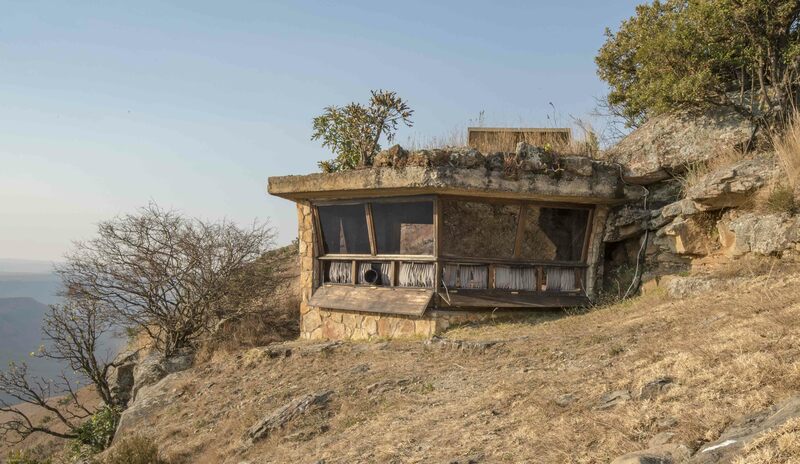 The Giant’s Castle vulture hide perched on the edge of a steep cliff in the middle berg. 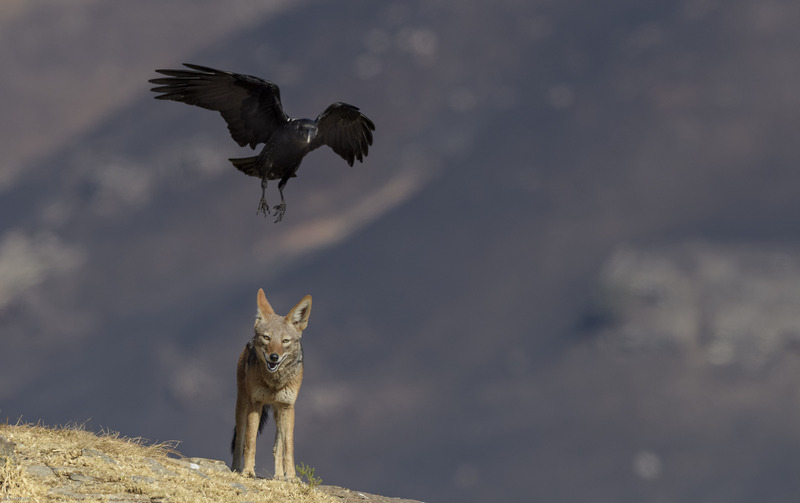 The White-necked ravens were ever present even when the jackals were looking for food. Needless to say the jackals got whatever they wanted. 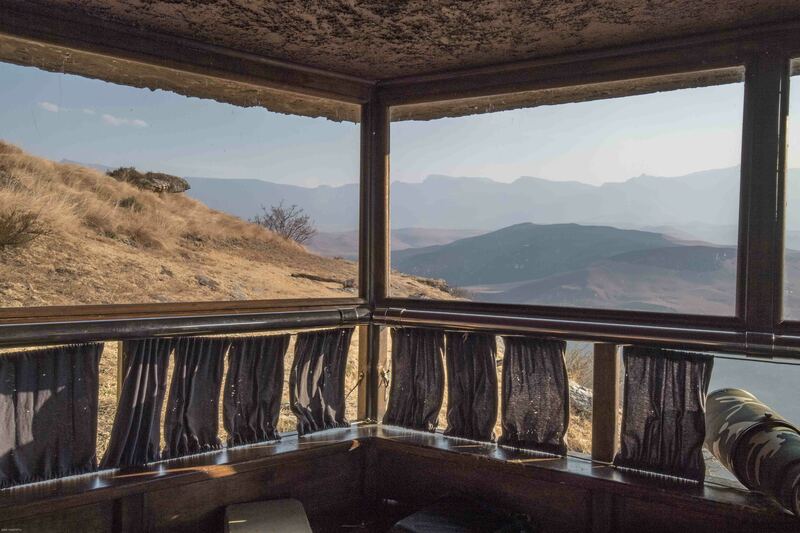 A view from inside the vulture’s hide looking south west across the ridge and off to the upper berg. 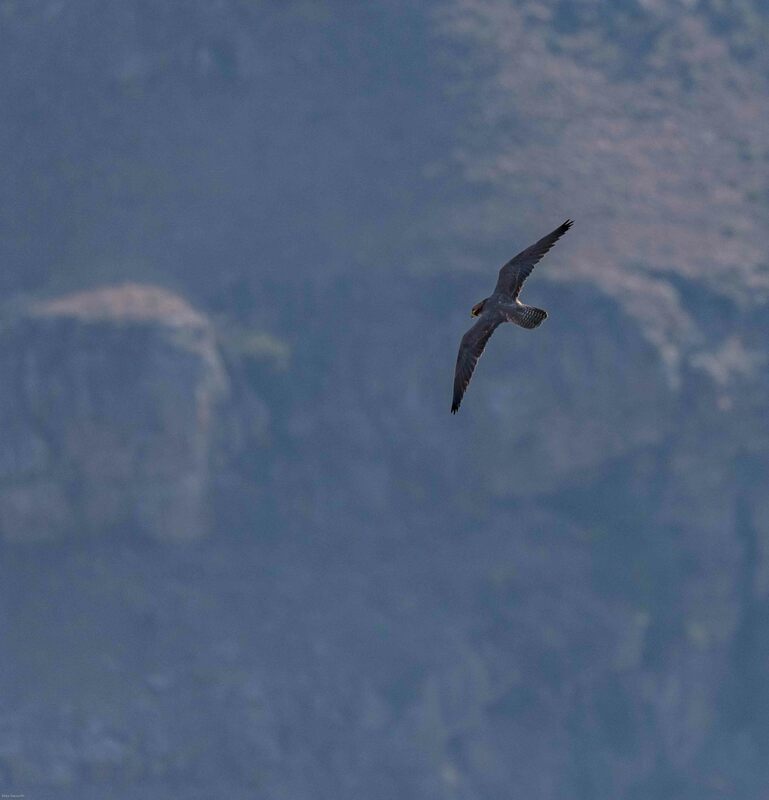 A Lanner falcon came to visit and stirred things up among the ravens. 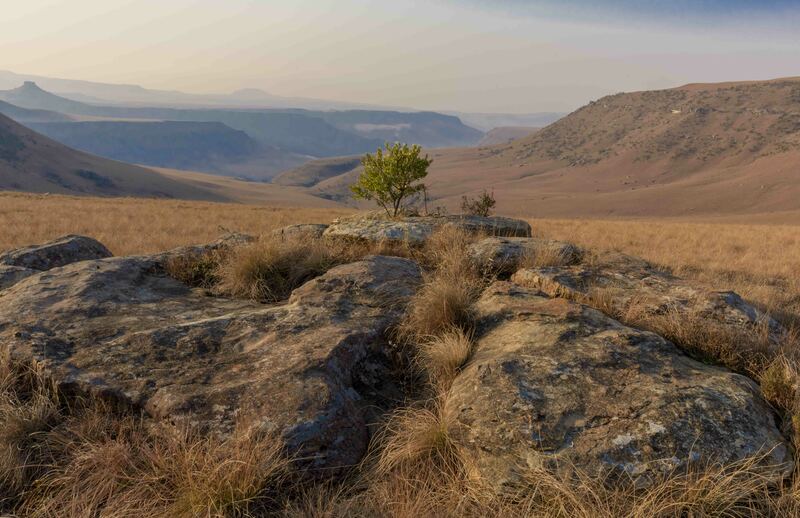 A view of the terrain on the way to the vulture’s hide. 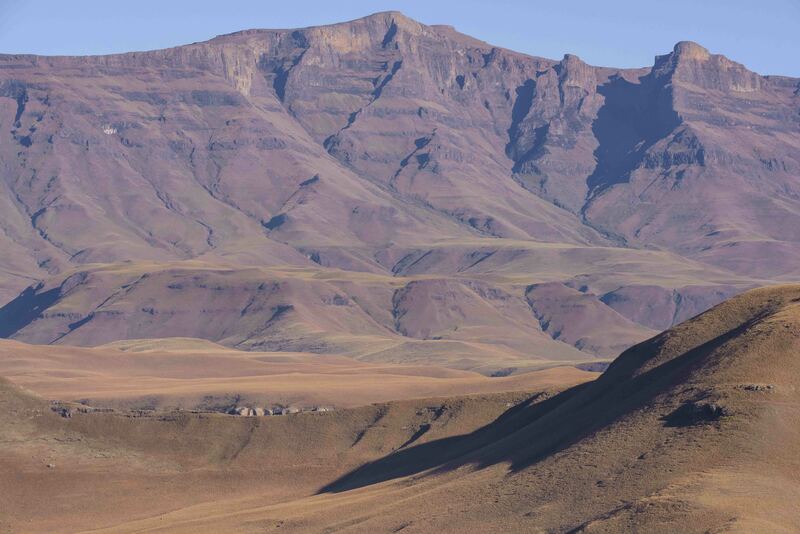 Vast, magnificent and quiet but for the wind singing in the grasses. 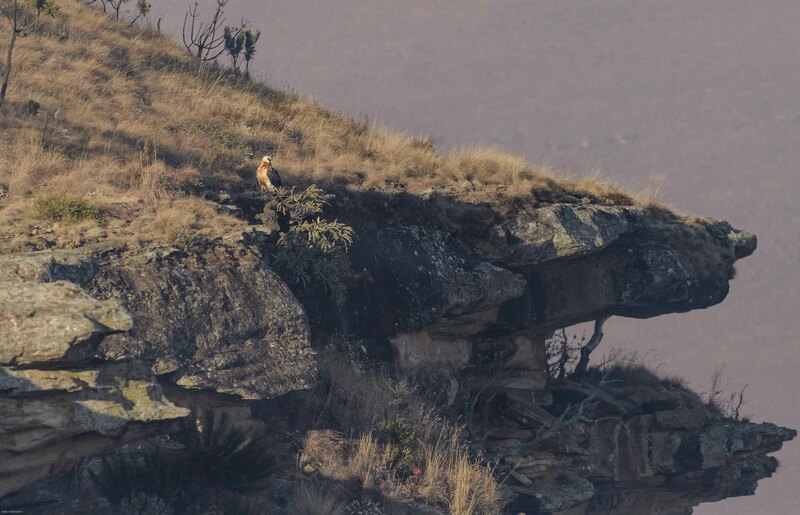 A Bearded vulture sitting looking out from the edge of a cliff in the middle berg. 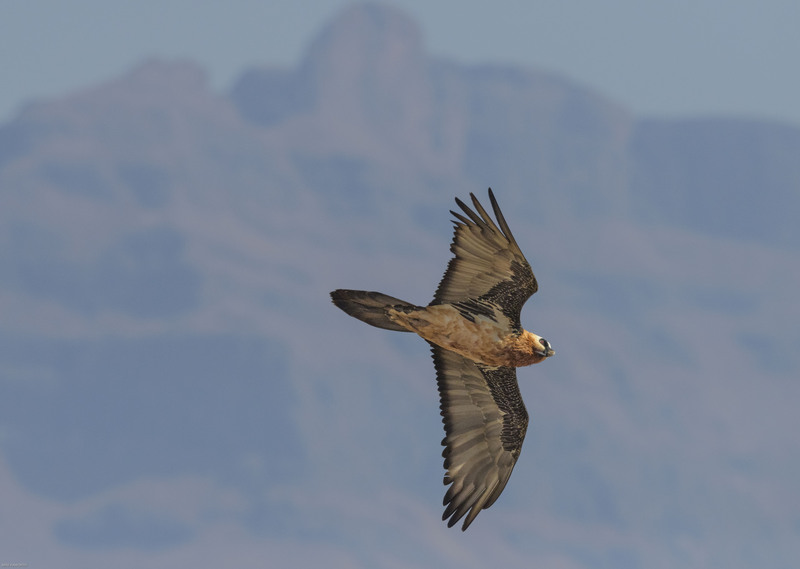 Breathtaking views and colours as seen from the hide-early morning views. 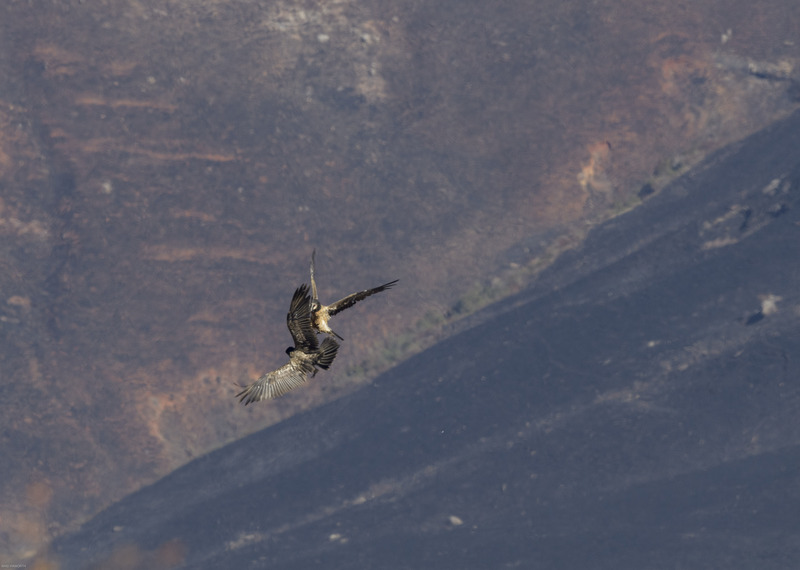 Two juvenile Bearded vultures sparring high above the valley floor. Early morning before the sun had risen -there was a stillness but the colours were vibrant and the scene sublime. 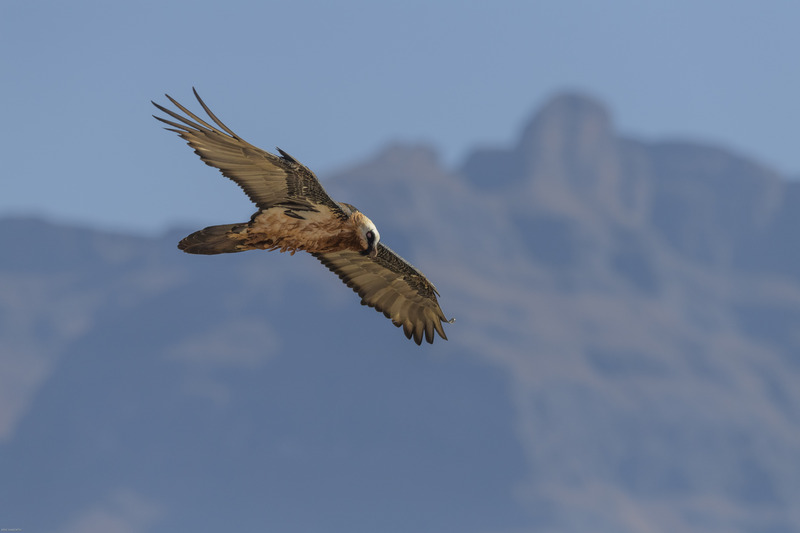 A Bearded vulture flying with the basalt buttresses in the distant background. 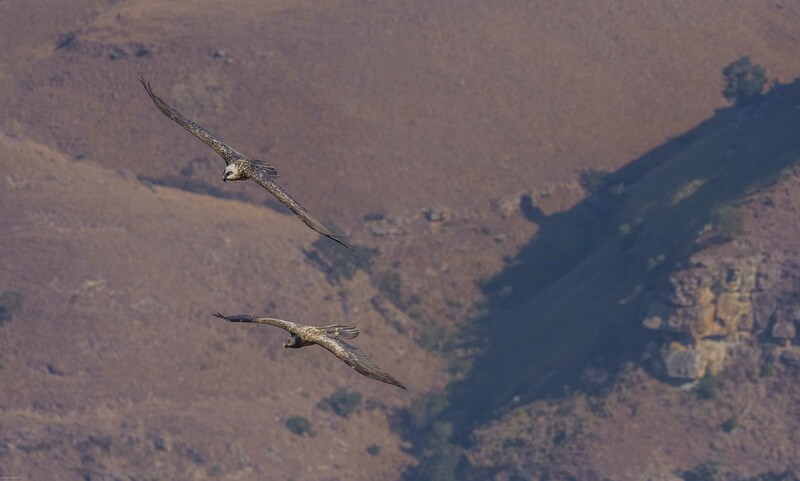 An adult and juvenile flying together way above the valley floor. Late afternoon just above the hide looking south west. 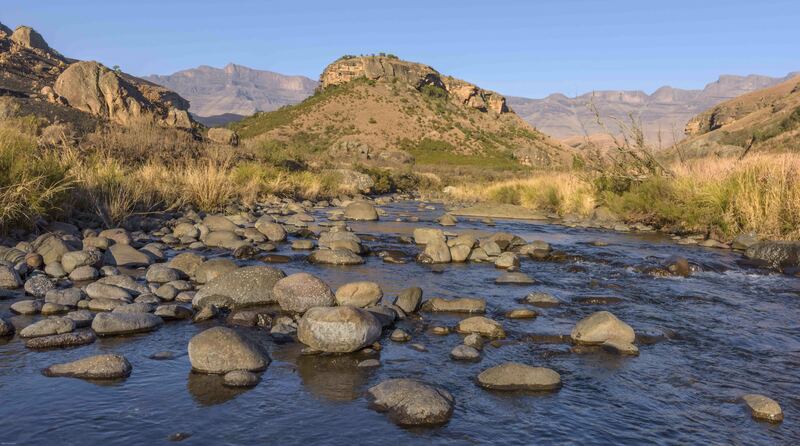 Below the middle berg, this time along the Bushman’s river. 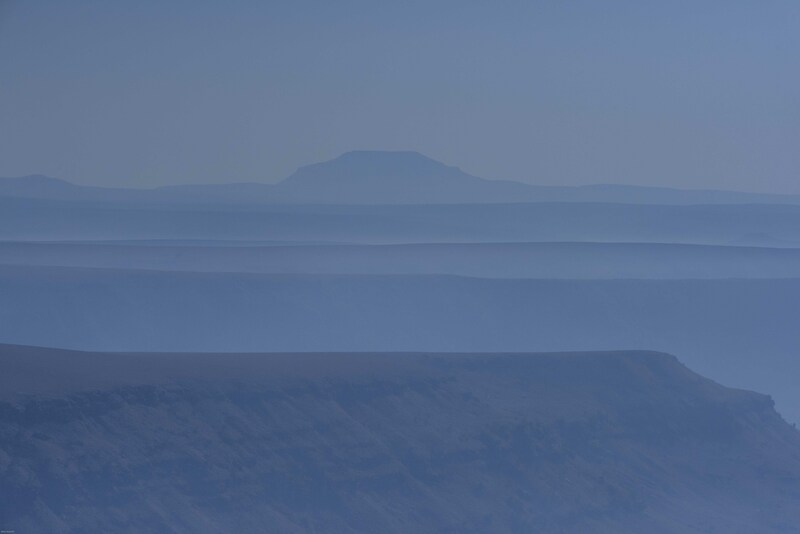 It was early morning with the first light illuminating the tops of the middle ground hilltops. The white you can see in the foreground was frost. It was ice cold at that time. Nothing a cup of hot coffee and rusk could not ward off. 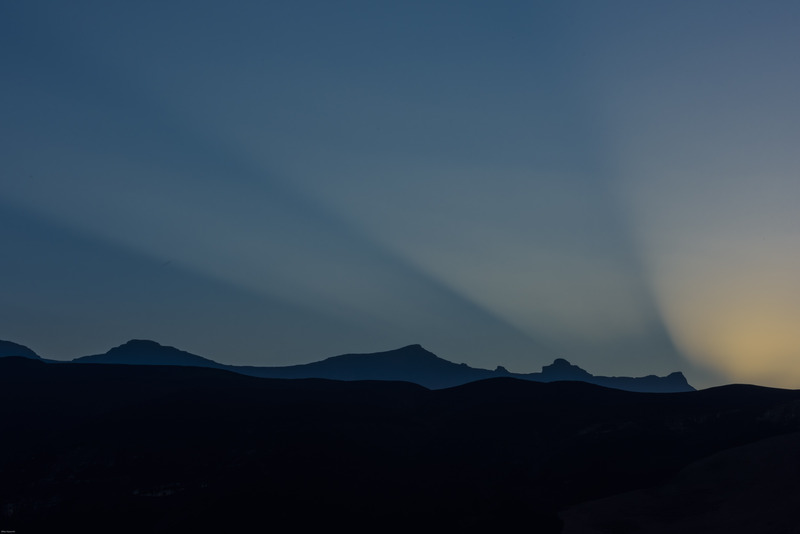 The sun had not yet peered into the valley but some of the reflections of the light from the hilltops were beginning to be caught in the reflections in the river. Just stop on your walk and look around. You might be surprised at the eclectic colour and textures you might see. 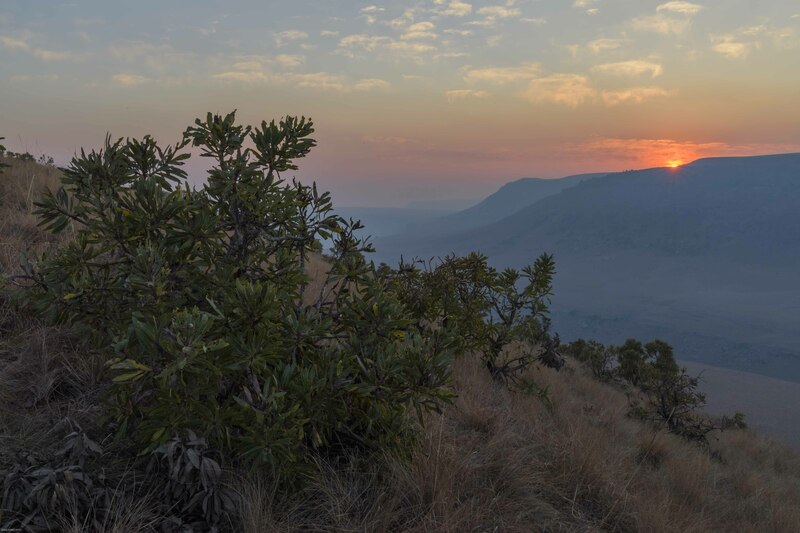 “It is not so much for its beauty that the forest makes a claim upon men’s hearts, as for that subtle something, that quality of air that emanation from old trees, that so wonderfully changes and renews a weary spirit.” – Robert Louis Stevenson. 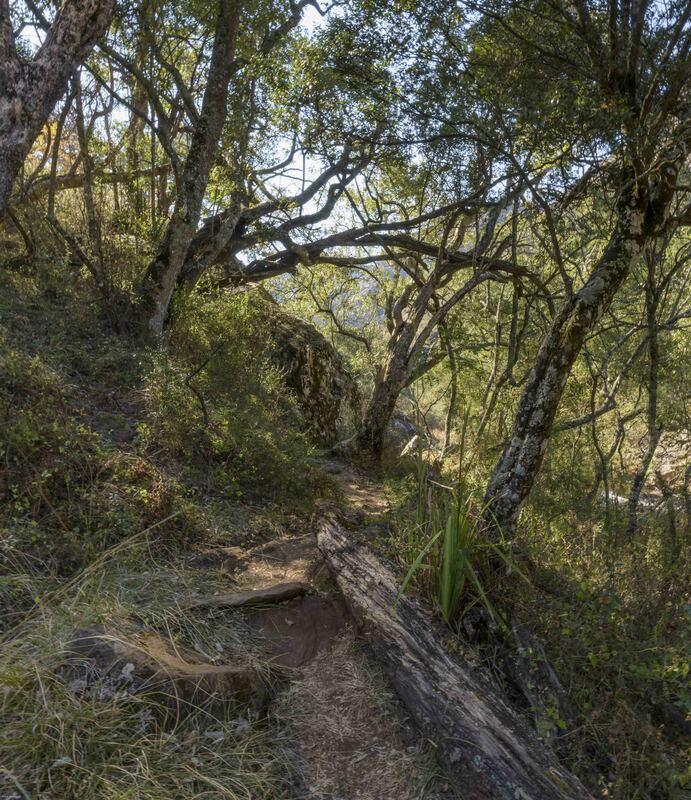 A short walk up the one of the valleys – verdant even in mid-winter. The sunlight was now filling the valley. 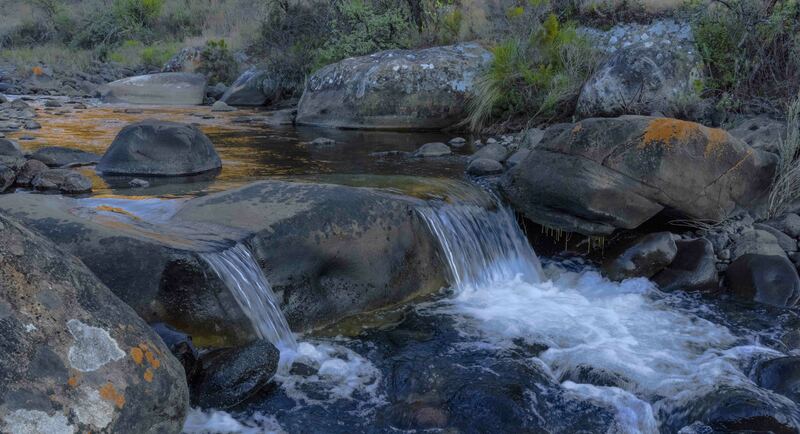 The river was strewn with rounded boulders which have been shaped over hundreds of years. The sun illuminated the river course beautifully. On our last evening, once it was too dark to photograph from the hide, we drove to an adjacent area south west of the hide to watch the sun setting in the west. The spectrum of colours melted from warm to cool with a warm hue. It is at times like this when you feel alive and grateful to be able to witness this incredible beauty. The last light show from what was a spectacular day. I have enjoyed this series very much – thank you! Thank you Anne, I am very pleased you enjoyed it – stirring many memories! !